Best Original: I will give this honor to "Why Does this Always Happen to Me?" because it uses a similar formula as "A Complicated Song" to make it funny. These types of songs always make me laugh. Location: In a Split Level Cave 20 miles below the surface of the earth. It's a tough call, but while musically "Hardware Store" is probably the most impressive thing Al's ever done, I've got to go with "Why Does This Always Happen To Me? 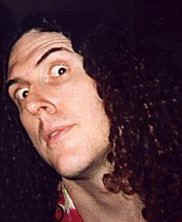 ", if only because I might be a bigger Ben Folds fan than a Weird Al fan (It's close, I swear! ), so I couldn't really pick anything else. As for the parodies, The Angry White Boy Polka still makes me laugh, but I must admit I'm starting to tire of the rest. i was about to say the exact same thing, except i wasnt going to read your post and say as much, just what a quoted! This is the first Weird Al album that I like every song on. A four way tie between A Complicated Song, Trash Day, Couch Potato, and Ode to a Superhero. mine have to be "Why Does This Always Happen To Me?," "Wanna B UR Lovr," and "A Complicated Song." A Complicated Song is hilarious! And Why Does This Always Happen To Me is pretty funny as well. Meh, me likes them all.